‘Stop that, now!’ he said, imitating his father. My four-year-old daughter is always trying to imitate her older sister. He imitated her accent perfectly. The bigger kids keep tormenting him. She had phoned beforehand to let me know she was coming. If you do most of the cooking beforehand, you’ll enjoy the evening more. 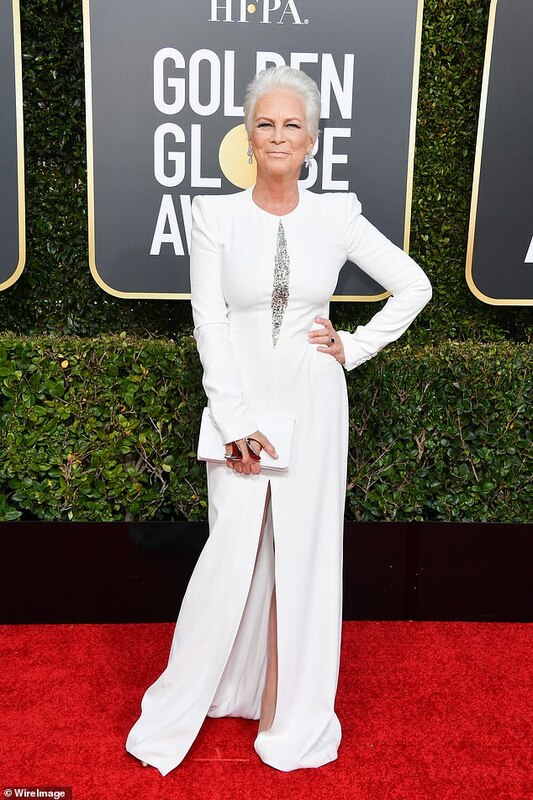 Jamie Lee Curtis has apologized for making a ‘snap judgement’ about the group of Kentucky Catholic high school kids filmed mocking a Native American man at the Lincoln Memorial on Friday. 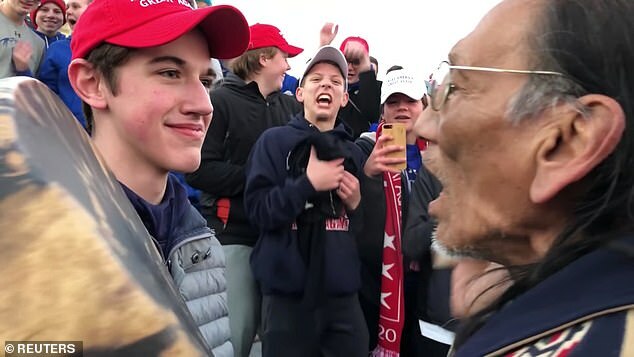 The actress tweeted on Sunday after watching extended footage of the moments before the students from Covington Catholic High School were filmed taunting Nathan Philips, 64. It showed them being repeatedly called names and insulted by a different group of protesters and Philips approaching them on the steps of the memorial and not the other way around. The president has since tweeted in defense of the school children – most of whom were wearing MAGA hats at the time – and there is sweeping support for them on social media. 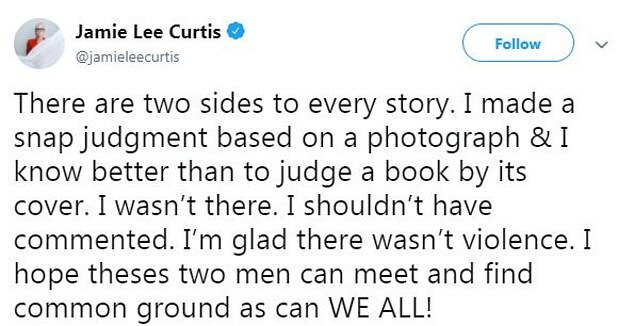 Curtis has since deleted the tweet she originally made judging the teenagers and there is no trace of it online. She nonetheless felt the need to walk it back on Sunday. Reposting a screenshot of a statement made by Nick Sandmann, the student who stood opposite Philips while he beat his drum, she tweeted: ‘There are two sides to every story. There are possible risks, but nonetheless, we feel it’s a sound investment. He has since walked backhis opposition to the bill. She later attempted to walk back her statement. With massive video evidence, he walked back his claim that he was spat on. ‘I made a snap judgment based on a photograph & I know better than to judge a book by its cover. I wasn’t there. I shouldn’t have commented. Later, she posted again to urge President Trump to invite Sandmann and Philips to the Oval Office to meet up and put the angry discourse about their confrontation to bed. She made reference to the meeting Barack Obama arranged for Henry Louis Gates, a black homeowner who was wrongfully arrested trying to get into his own home in 2009, and the white police officer who arrested him. Some followers applauded Curtis for changing her opinion whereas others were disappointed by her swaying view. Other celebrities, including Alyssa Milano, have are staying firm in their opinion of what happened. She tweeted on Sunday that the MAGA hat was the ‘new white hood’ – a comparison between Trump supporters and the KKK which enraged thousands. It seems increasingly unlikely that the two sides will find any common ground. I hope we can finally put this issue to bed. We thought we’d put the issue to bed, but it was brought up again at the next meeting. Do not allow yourselves to be swayed by these arguments. Her speech failed to sway her colleagues into supporting the plan. Were you swayed by her arguments? The trees were swaying in the wind. Their bodies swayed to the music. She walked along, swaying her hips.